Hi guys. How was your weekend? My weekend was pretty relaxing. Apparently I've been hiding under a rock and never got the opportunity to watch Game of Thrones. After weeks of being forced presured by my boyfriend. I was finally persuaded to sit through one episode. I'm actually glad I did, because I am now addicted. I am now attempting to catch up to the current season. I think I mentioned before that after the color pink, neutral color tones are my second favorite. I styled this outfit around these colors. 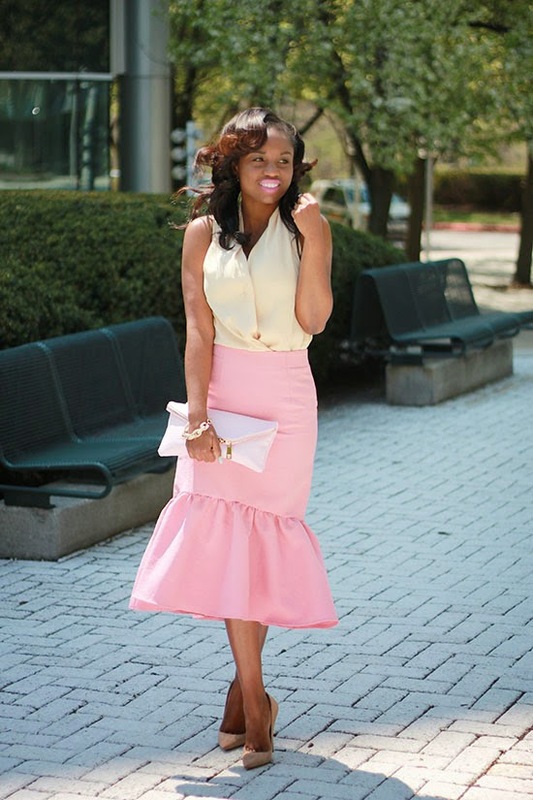 I wanted a subtle and toned down look with the focal point remaining the peplum hem skirt. As mush as I love a structured suit, sometimes a colored suit is what's needed to brighten up a day in the office. I took a casual approach with this suit by rolling up the sleeves and pairing it with a T-Shirt and a statement necklace. Happy Easter! I hope everyone had a wonderful Easter weekend for those who celebrate it, and for those who don't, hope you had a fantastic weekend as well. Most of my weekend was spent in Church for Easter celebrations. Now to the good stuff. I combined some of my favorite pieces to achieve this sparkly look. 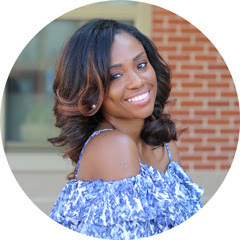 I adored this peplum blouse when it first came out but was quickly sold out. During my usual daily dose of browsing Asos's site, I saw that they restocked the top so I quickly added it to my cart and checkout. Although, I wish I would have waited because it later went on sale. 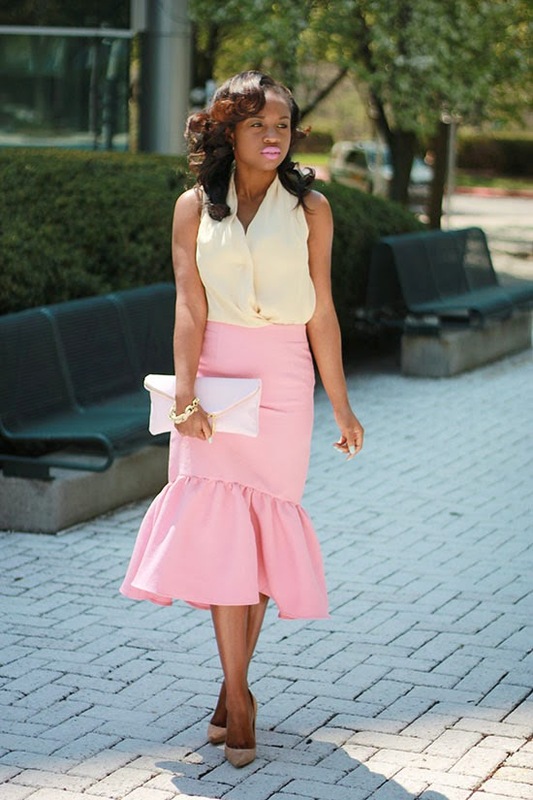 I paired the dramatic blouse with a pearlescent pink skirt and added a pop of color to compliment my look. Hope you had a great weekend and an even better work week. I spent most of my saturday running errands then relaxing. After church on Sunday, I attended a very close friend's wedding. I snapped a quick pick of what I wore on Instagram. I had such a blast celebrating with them and loved the intimacy of the ceremony. When picking out this outfit, I wanted to focus on the pink on top of the hen. Luckily, I had a great pair of pink pumps to compliment it.